This is a book about memory. It began life as an on-line blog written over 5 years. The chapters are cherry-picked from that blog. The book comprises brief chapters followed by a list of writing prompts inspired by the chapter. There are photos from the author’s own album and the occasional recipe. 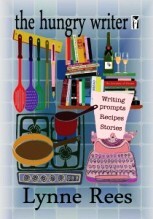 There is a holistic feel to each chapter as both recipes and prompts are inspired by each anecdote or discussion. The book’s cover has a tactile feel and the chapters are not over-long so invite the reader to dip in again and again. Rees effectively uses food as the chef agent for drawing up memory. The narrative broadly starts as she and her husband are moving back from France to Kent. What makes the story so interesting is her ability to keep to the narrative arc but at the same time allow the inclusion of memories from childhood and early adulthood in ways that arise naturally. The chapters are laced with humour but similarly offer reveries on quiet serious subjects such as animal cruelty. Thus in ‘The Cooked and the Cruel’ the subject of the ortolan – a small bird drowned in Armagnac – is discussed in terms of the tension between loving the taste and reconciling it with the knowledge of how this delicacy is achieved. In a similar vein in the chapter ‘Cruelty and Kindness’, the writer revisits a guilty childhood memory of bullying a playmate into eating mud. Each of these chapters, as with others in the book, deals with both moral and philosophical arguments. Thus some chapters became reveries kick-started by memory. Rees’s contemplations range from death, celebrating the loved one with a feast, to asking herself ‘Are We all Racists?’. There is also a section on the seeming random nature of memory and how it can simply bubble to the surface of the mind. The writer’s skill here is to contemplate such matters in an easy and very readable style that engages the reader in the contemplation. Food then is the catalyst for each chapter. Rees is no food snob. Hailing from a working class background in Wales, she celebrates the meals of her childhood. These include the delights of crisp sandwiches. At the same time as she examines the past we get a sense of a strong and loving family with a mam who could cook up Ideal milk jelly and welsh cakes. As the narrative moves on to her marriage we have great food memories of a couple who clearly embrace life. These anecdotes involving her husband are enlivened by incorporating dialogue which adds to the conversational style of the book. Again these are not always complicated recipes but a celebration of ingredients such as great cheeses, wines and in one instance we learn of Rees making the long journey back from France to Kent with a container of figs nestled in her lap. Rees writes well about food. She describes it sensually with the ability of a food writer. She makes us see in this way that food is one of the pleasures of life. Move over, she writes with an intimate style (born out of the blog I suspect). This closeness is aided by the inclusion of the writing prompts that invite the reader to consider their own memories. Rees is a creative writing tutor and so there is a feeling that we are involved in a relaxed tutorial. Food for Rees is talismanic. It is to be savoured for its own sake but at the same time is also a way to ‘Eat, Laugh, Cry, and Remember’. It is a means of taking time out from a frenetic world. In the above chapter the author and her husband periodically have their own ritual of dining in the kitchen with good bread, cheese, wine in order to talk and return to each other. Rees is quite honest about her relationship; and in ‘The Second Bottle of Wine Argument’ she reveals that marriages can have their ups and downs. Yet the overarching message is that food draws families and relationships together if we allow it. Indeed food is shown to be linked to human emotion. Although childless herself, the writer sets great store by cooking treats for a beloved nephew. Similarly she prepares lavish meals for the family as a symbol of her love for them. This is an unusual and charming book. It foregrounds the link between food and memory. The writing prompts invite us to join in the process of engendering memory. The recipes are eminently do-able even for non-cooks. The reveries encourage us to contemplate our own responses to the moral and philosophical content. This is a book that is deceptive. Its skill lies in encouraging us to think deeply about the past, about moral issues and about our own relationship with food.